Parque das Aves is an internationally recognized rescue and conservation centre for birds, located in the middle of the rich and exuberant Atlantic Rainforest, neighbor of the Iguaçu National Park. Backstage Experience is your opportunity to have a look during a tour that lasts 1 ½ hours. 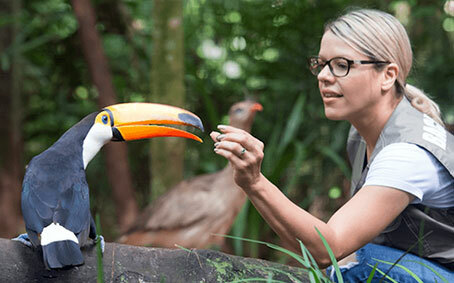 It includes access to restricted areas and the privileged contact with some birds, featuring feeding of toucans and other species and the opportunity to better understand the conservation and rescue programs at Parque das Aves. At the end of the experience, you will be taken to an outdoor deck in the middle of a butterfly garden, and have the privilege of interacting with a macaw and getting to know a boa constrictor, as well as refreshing yourself with seasonal drinks and fruits. 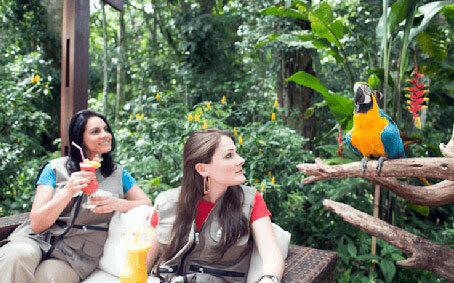 Since animal welfare is our absolute priority, the content of the tours can vary without further notice.